My Wine of the Month for November is Beyerskloof Diesel Pinotage 2014. This won the Abraham Perold Pinotage Trophy at this year's International Wine and Spirit Competition and I was lucky enough to drink it with lunch. Diesel is a barrel selection of the best; just 22 barrels out of 300 were selected for the 2014. The wine fermented in open casks for 5 days, with punch downs every 2 hours, and it was matured 18 months in 100% new French oak barrels. Primarily pure fruit with hints of licorice, mint, coffee beans and smoky aromas. Great concentration of flavours on the palate, silky smooth texture, long finish with a hint of chocolate. To London’s Guildhall to present winemaker Anri Truter with the Abraham Perold Pinotage Trophy at the International Wine and Spirits Competition 2018 awards ceremony held on Wednesday 14 November. The Pinotage Trophy was presented to Anri by Peter May representing The Pinotage Association, sponsors of the Trophy, and IWSC President Facundo L Bacardi, for the Beyerskloof ‘Diesel’ Pinotage 2014. Anri Truter was called back to the stage again later that evening to collect the Blended Red Wine Trophy for Beyerskloof ‘Faith’ 2014. 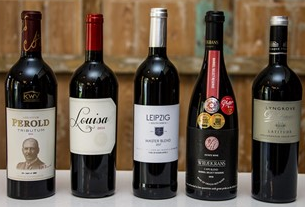 There cannot be a wine producing country that doesn’t produce a red blend, yet again South African wine makers confidence in the Pinotage based Cape Blend concept was rewarded by beating all comers. 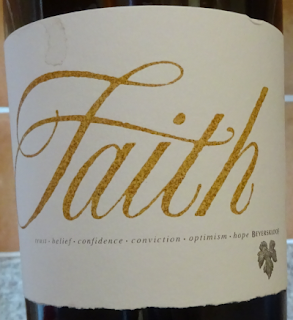 Faith 2-14 is a blend of 34% Pinotage, 33% Cabernet Sauvignon and 33% Merlot. Applauding Anri’s triumph in the Guildhall was Beyerskloof owner Beyers Truter and Managing Director Barnie van Straten. 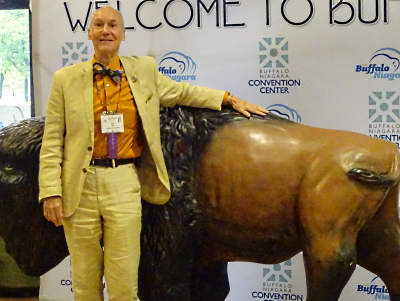 To Buffalo, New York State, for the American Wine Society 51st annual National Conference. 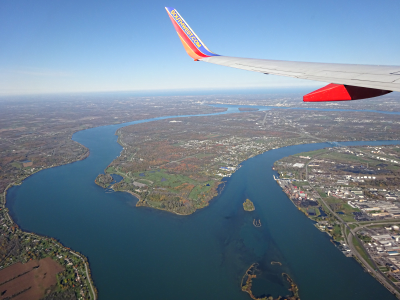 Flying into Buffalo. On left is Canada, right is USA, at bottom is Lake Erie. In middle is Grand Island. The two rivers merge at top of picture to plunge over Niagara Falls. Buffalo is on the banks of Lake Erie a few miles from Niagara Falls. It’s the home of Buffalo Wings and the sliced beef filled kimmelweck roll ‘Beef on Weck’. The venue was the Hyatt Regency Hotel and Buffalo ConventionCentre. 500 AWS members, plus exhibitors and presenters attended, the furthest travelled being two winemakers from Slovenia. Slovenian wines were one of the sponsors and the Slovenian ambassador travelled up from New York City to give a witty speech to us over dinner while we tasted wines from his country. Details of the contributors, their wines and links to wine fact sheets are on the AWS 2018 tab at the top of this site. 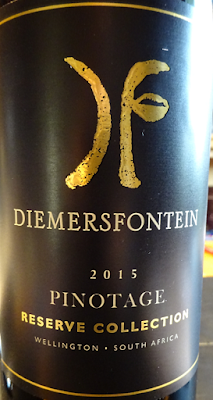 My Wine of the Month for October is Diemersfontein 'Reserve Collection' 2015 Pinotage. This is exclusive to Woolworth in South Africa which is where I got it. 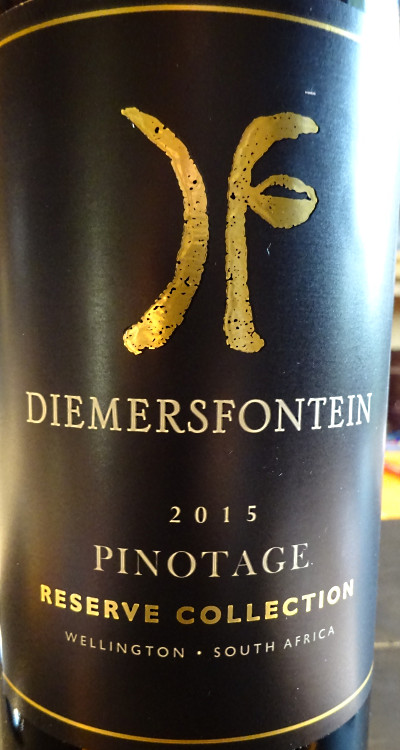 Diemersfontein is famous for its popular 'coffee and chocolate' Pinotage which they invented, but they also make the superb traditionally styled 'Carpe Diem' Pinotage. Though this has been, according to the back label, especially blended for Woolworths by their wine expert Allan Mullins, it's in the same camp as Carpe Diem. The wine is intensely coloured with a spicy nose. It's soft yet there's welcome structure of tannin on the finish. It offers flavours of cream and cherries, there is a hint of chocolate and an overall delicious spicyness. A lovely wine. What will you be drinking? 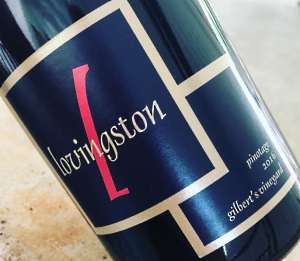 Lovingston Winery, near Charlottesville, Virginia, are holding a vertical tasting of their estate-grown Pinotage on Saturday, Oct. 6th from 11am-5pm. 10 vintages from 2006 onwards will be poured. There are limited quantities of most years, so they suggest arriving early. For questions, please email Stephanie at info@lovingstonwinery.com or call 424-263-8467. 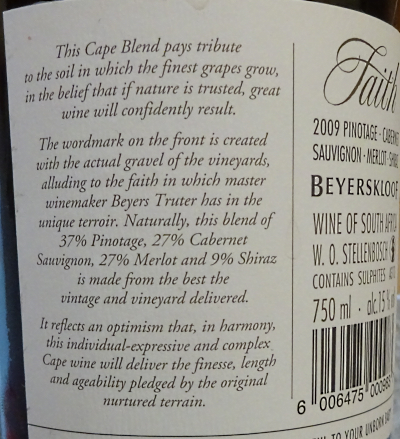 My WoTM for September is Beyerskloof 'Faith' 2009 Cape Blend. This is presented in a statement bottle with deep punt and weighing 1.2Kg when empty, more than a full bottle of their standard wines. The word Faith dominates the label, with Beyerskloof in small grey letters in the bottom corner. Run your fingers over the yellow italics to feel a rough surface. The name is created crushed gravel from Beyerskloof's vineyards. 2009 is a blend of 37% Pinotage, 27% Cabernet Sauvignon,27% Merlot and 3% Shiraz. After 9 years bottle aging this is a complex smooth delight. Pinotage sweetness tempered by the Cabernet and Merlot, with its spicyness enhanced by Shiraz. It's lightfooted despite its 15% abv, thrillingly linear with plenty of spicy blackberry and red plum fruits. A truly delicioius food wine. Technical fact sheet is here. Beyerskloof has won the 2018 IWSC Pinotage Trophy, sponsored by the Pinotage Association, for Beyerskloof Diesel Pinotage 2014 which IWSC judges praised for its “great concentration of flavours on the palate, silky smooth texture, and long finish with a hint of chocolate”. Beyerskloof's Faith,WO Stellenbosch, Cape Blend won Gold Outstanding for the 2015 vintage and Gold medals for its 2014 and 2011 vintages. WO Coastal: Shiraz, Pinotage, Malbec, Cabernet Sauvignon, Petit Sirah. Winemaker Louwritz Louw. WO Western Cape : Pinotage, Merlot, Cabernet Sauvignon, Cabernet Franc, Petit Verdot. Winemaker: Vian Bester. WO Stellenbosch: Cabernet Sauvignon, Pinotage, Shiraz. Winemaker: Danie van Tonder. WO Swartland: Pinotage, Cabernet Sauvignon, Shiraz, Petit Verdot. Winemaker: Dewald Huisamen. WO Paarl: Pinotage, Cabernet Sauvignon, Shiraz . Winemaker: Stander Mass . WO Stellenbosch : Pinotage , Cabernet Sauvignon , Merlot . Winemaker: Anri Truter. WO Swartland: Pinotage, Cabernet Sauvignon, Shiraz, Petit Verdot. Winemaker: Dewald Huisamen . WO Wellington: Pinotage, Cabernet Sauvignon, Shiraz. Winemaker: Francois van Niekerk. The judges were Jacques Roux (marketing director of DGB), Fred Viljoen and Johan Malan (proprietors and cellarmasters at Viljoensdrift and Simonsig respectively), Susan Erasmus (Laffort), Brad Gold (CWM) and winemaker Guy Webber. This the eighth year of the competition and there were 51 contestents. A Cape Blend must consist of 30-70% Pinotage, all 5 winners included Cabernet Sauvignon in their blend. De Wet Viljoen, vice-chair of the Pinotage Association, said the competition is a testament of the bright future of Cape Blends. He added that the quality of the finalists this year was truly phenomenal and the wines show balance, elegance and structure that will carry the wines with aging. Winemakers spend a lot of time and compassion to create their blends and the fact that these wines are sold at premium prices also indicate the seriousness of the wines. Beyers Truter, chairman and founder of the Pinotage Association, highlighted that Pinotage’s quality is on the upsurge and that the market for wines made from this cultivar continues to grow. 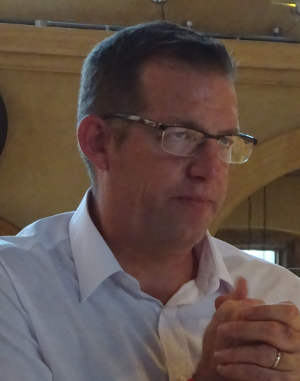 One of the judges, Samarie Smith, said the quality of the wines in this category was phenomenal, with judges giving near-perfect scores for some of the wines. Rijk’s won their 12th trophy this year. 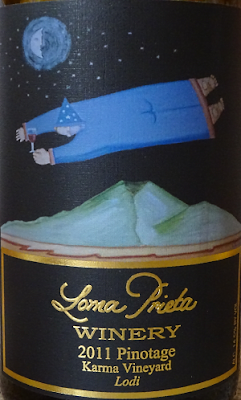 My WoTM for July is Loma Prieta ‘Karma Vineyard’ Lodi Pinotage 2011 – in memory of owner and winemaker Paul Kemp who died earlier this month. 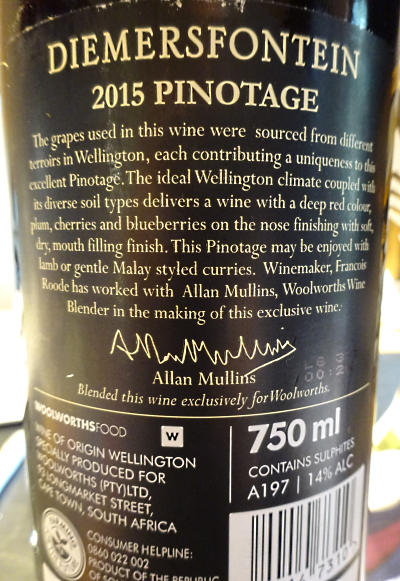 Paul had bought surplus Pinotage grapes from another vineyard some years previously, made wine and fell in love with the variety, as did visitors to his winery where the wine swiftly sold out. 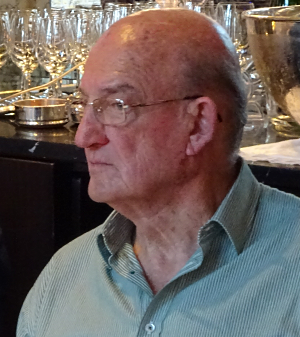 Paul increased production, buying in grapes from various California vineyards as well as planting Pinotage. It wasn’t long before he grafted over his Pinot Noir to Pinotage, and he was making three single vineyard wines from contracted growers as well as his own estate Pinotage. By now Loma Prieta was the largest Pinotage producer in North America and subscribers signed up to Paul’s Pinotage Wine Club to ensure they received regular consignments of Pinotage. 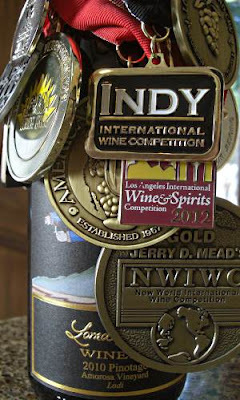 Paul loved entering his Pinotage into competitions and his tasting room bottles were so covered with medals hanging form ribbons it was difficult to see what they were. 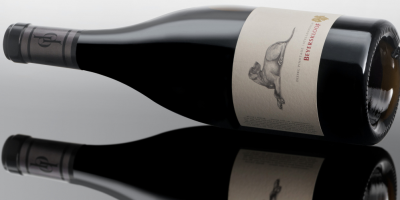 Among the many awards was the American Wine Society Trophy for Best Red Wine in 2014 for Bodo’s Blend, an 80/20 blend of Pinotage and Petite Sirah. 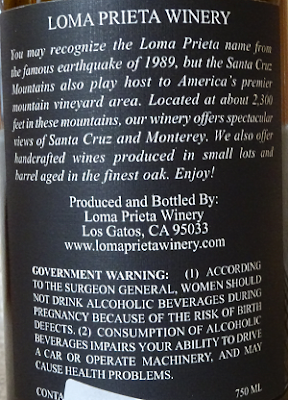 Bodo is name of the magician seen flying on Loma Prieta labels, with the eponymous mountain in the background. 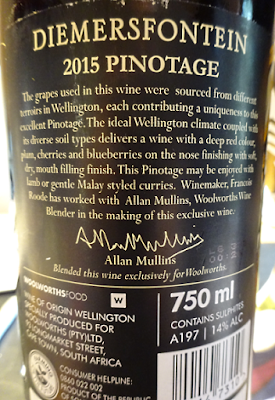 In 2016 Paul released the world’s first white Traditional Method sparkling Pinotage. My wine of the month is a red I have aged, made with grapes sourced from the 8 acre Karma Vineyard in Lodi, planted in the 1990s. Loma Prieta ‘Karma Vineyard’ Lodi Pinotage 2011 is showing signs of age, its colour faded from its intense garnet of youth to a paler red brick. 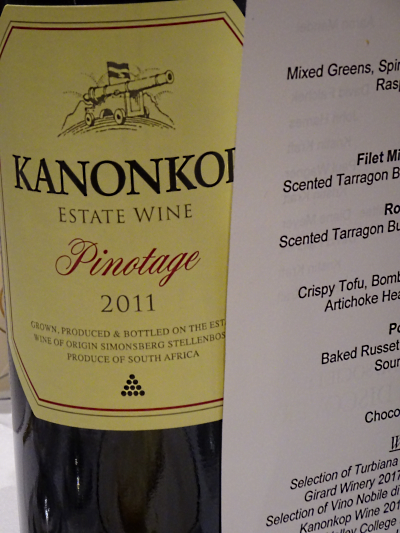 Pinotage sweetness is to the front, the wine is lighter bodied and has thrown a lot of sediment. There’s some refreshing acidity that encourages another glass. A delightful and classy wine, but if I had any more bottles left I’d drink them rather than keep them longer. Off to London on a lovely Tuesday evening when the temperature is in the 30s. Thameslink, now on its second emergency timetable in as many months actually delivered a train, and on time. 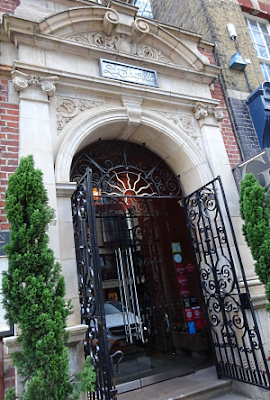 Venue is La Chapelle in Spital Square in the City. 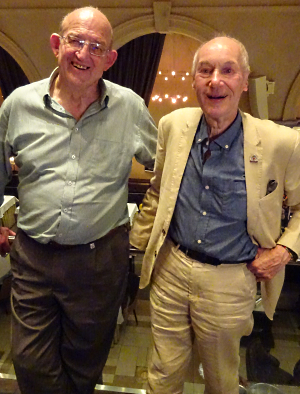 There I renew acquaintances with François Naudé Senior and Junior sitting in the bar outside with a drink. The duo are hosting a dinner with a vertical of each of the ten vintages of the legendary Vin de François. There are 12 of us, plus the two François and organiser and Vin de François fan Paul Plant. We move upstairs to the table on the mezzanine floor. Its open sides look down on the main body of the restaurant which is packed with diners. François Jr explains that the tasting will show the wine in pairs and threes, due to the restaurant not having 10 glasses for each of us. 2007 and 2008 are the first to be poured. Our location was hot and I thought the wines were served too warm. The 2008 was thinning and tasted alcohol hot, but this wasn't a fair taste as the wine should be cooler. “2008 wasn't as good a year as 2007,” said François Sr.
2007 was the better wine, but it too was showing age and served too hot for a mature wine. I'd had my last bottle of 2007 in January 2017 and thought then that was time to drink up. François Jr told how they had discussed how the wine should be marketed before deciding on selling it all on one night at an invitation only auction – a first for South Africa. Some cases are kept back: for charity, for the wine library and for the family. 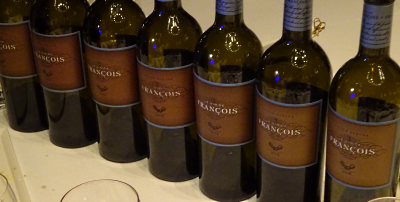 “I only get one case,” said François Jr.
2009 – sweet ripe fruit with an intense flavour but a short finish. 2010 – this was ripe and juicy, sweet and powerful and absolutely beautiful now. 2011 – this was closed and tight, not wanting to reveal itself. Will it open up in time or is this as good as it gets? “2010 and 2011 were difficult vintages,” said François Sr. The wines were coming fast, leaving little time to savour and discuss them. 2012 and 2013 were poured next. 2012 – was full bodied and mouth filling, but had alcohol heat on finish. 2013 – had a strange taste that I couldn't nail down. The MW next to me thought it was oxidised. François Sr noted there had been bottle variation between this and the same wine poured at the weekend. 2014 – Was taut, with a sweetness. 2015 – This was delightful, with sweet bright fruits, soft tannins and beautiful drinking. 2016 – A younger version of the 2-15 offering the same sweet fruit and a lovely drinkability. Did this last flight show better because the wines had, at our request, been cooled a little or because they were the youngest? But the event wasn't over, François Sr served his luscious white dessert 'port' with tarte tatin. My brief notes above are quite critical. I think Vin de François is a wonderful wine and I have been lucky enough to have owned six of the ten vintages, and to have drunk five of them: '07,08,09,10 and 15, but in good conditions. I think these wines weren't given a decent chance because they were served too warm. I have two bottles of the 2013, a vintage I have not tasted, so I must open one soon in view of the off bottle at this event. My favourite two of the event were the 2010 vintage, which I had two in 2014 and have one left in my cellar, and the 2015 which I bought a case of at the 2017 auction and have nine left. Many thanks to Paul Plant for organising the event and to François Naudé Jr and François Naudé Sr for shipping these 10 vintages from their cellar specially for the event and sharing their memories of this iconic wine.